Vermont is perceived to be a political outlier in the United States. It was the first state to outlaw slavery in 1777. And in our more recent history, Vermont was one of the first states to legalize civil unions and to push (unsuccessfully) for a single payer health care system. When it comes to race relations, it is assume d that Vermont is equally liberal and as result, racial bias towards people who are Black and Hispanic, evident in other parts of the country, should largely be absent here. This paper investigates that assumption. In particular, the authors analyze police traffic stop data to assess the extent, if any, of racial disparities in policing. 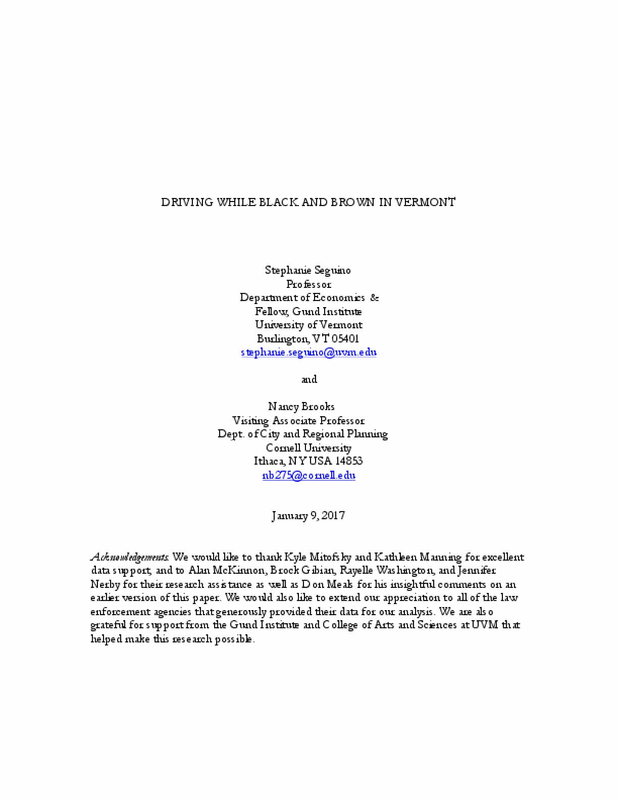 This task is made possible by legislation passed in the Vermont House that required police departments to begin to collect traffic stop data by race as of September 2014. Copyright 2017 by University of Vermont. All rights reserved.